From the 1790s, with the beginning of sealing, New Zealand formed links to Asia through trade and commerce. From 1866 South Island gold rushes drew thousands of Chinese gold miners. Pākehā New Zealanders regarded Asia as a strange, alien place, with large populations that might flood Australasia, so the government brought in laws designed to make it difficult for Chinese and other Asians to immigrate. Non-Asian New Zealanders gained much of their knowledge about Asia from the accounts of others who had been there. That included the settlers who had seen military service in India, and the missionaries who had worked in India and China. In the early 20th century New Zealand was still part of the British Empire, and New Zealand’s mistrust of Asia caused conflict with the British government. Britain, which ruled India at that time, worried that New Zealand’s anti-Asian immigration laws might encourage Indian protests. Britain also wanted to keep the Japanese government happy in order to form an alliance. New Zealanders, however, were nervous about Japan’s growing military power. Japan invaded China in 1937. New Zealanders had more sympathy towards China, and allowed the families of Chinese residents to come to New Zealand to escape the fighting. During the Second World War Japan attacked countries in the Pacific. Allied countries, including New Zealand, fought back. The Second World War ended in 1945 and the Cold War began – a long period of tension between communist and Western countries. Many Cold War conflicts took place on Asian soil, for example in Vietnam, and between North Korea and South Korea. New Zealand troops fought on the side of the Western countries. Those troops stationed in Korea formed new, positive impressions of nearby Japan, which they visited while on leave. 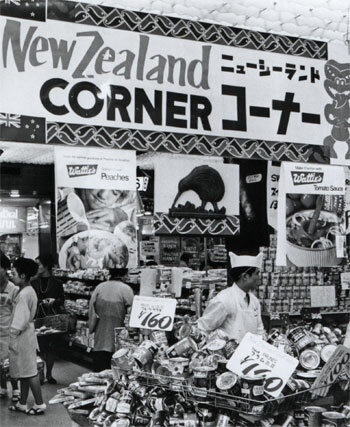 In the 1970s New Zealand’s economic ties with Britain loosened and the economic power of Asian countries such as Japan and China began to grow. New Zealand looked to Asia for new trading partners, and changed its immigration policies to attract migrants from Asia. It also welcomed Asian students and began to accept thousands of refugees from Asian countries racked by war. By 2006 Japanese had become the second most popular language learned at New Zealand secondary schools, after French. Also that year 354,552 New Zealand residents identified themselves as being of Asian ethnicity. New Zealand’s links with Asia were stronger than ever.